Some days ago there was a strong typhoon in Japan, so I thought this would be a nice kanji tip! 暴風, meaning windstorm, is read ぼうふう, boufuu. 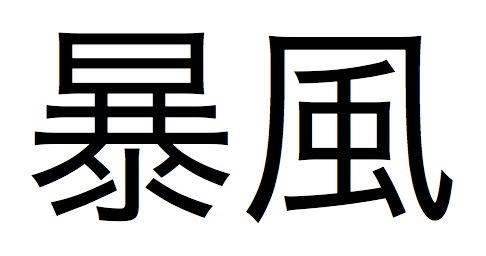 The first kanji is mainly related to violence, like in the word 暴力 (meaning violence, force), but it is also related to the sun or light, as the upper part suggests (日, ひ, hi, meaning sun). In the sun/light case, we have the example of 暴露 (being read ばくろ, bakuro, in this case), which means exposure, revelation. However, in the case of the windstorm it points to the “violence” meaning. So it is this simple: violence + wind = windstorm! Be careful not to be blown away!